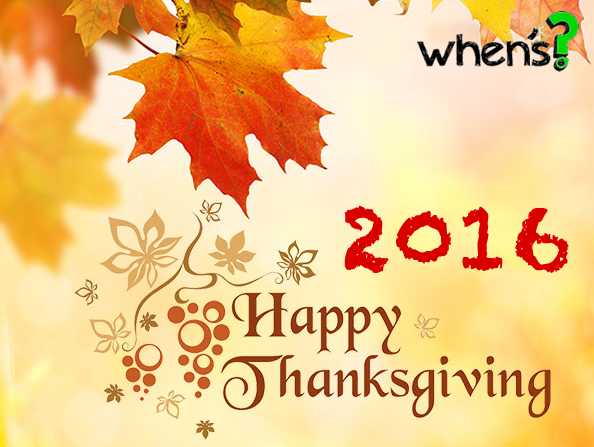 When’s Thanksgiving Day in 2016? | When's? When’s Thanksgiving Day in 2016? Im sure you can’t wait for Thanksgiving to arrive – A four-day weekend, good food, family time, a break from work/school, what else is needed – Right? Well, this year Thanksgiving falls on Thursday, November 24th, 2016 (two days earlier than last year). If you’re Canadian, you’ll celebrate Thanksgiving this year on Monday, October 10th. On Thanksgiving day you’ll find all government institutions closed. That includes the post office, city hall, and IRS branches. Most people don’t go to work or school, and many stores are closed as well – Some for the entire day while others may have shortened holiday hours. If you’re planning on heading to for a little shopping then be sure to plan your day accordingly. The Thanksgiving weekend also marks the beginning of the holiday shopping season, with Black Friday following the day after, Small Business Saturday after that, and then Cyber Monday on the following Monday. Traditionally, the best deals were reserved for the brick and mortar stores early on Friday morning, but in the last few years most retailers have extended the savings online and start the discounts the entire week leading up the holiday weekend. So what does Thanksgiving mean to you? Let us know in the comments below! Previous PostWhen’s The Tax Deadline for 2016?Next PostWhen’s Boxing Day in 2016? When’s The Tax Extension Deadline in 2016? When’s Boxing Day in 2016? When’s The Tax Deadline for 2016? When’s Black Friday in 2016? When’s Black Friday in 2014?